17-May-2015 -- Continuing south following an incomplete visit to 47N 120W (in the Columbia River), I wanted to try to visit this point in southern Washington, before I returned to Oregon. This ‘Forgotten Confluence Point’ had been visited just once before - by James Jamison in June 2001. Driving south, I crossed over the evocatively-named Horse Heaven Hills - but unfortunately didn’t see any horses. Unlike James Jamison in 2001, I had no trouble finding access roads that led to the confluence point. From Alderdale Road, I turned onto a gravel road that connected with Garbage Canyon Road (another gravel road). Despite its name, Garbage Canyon Road is actually quite scenic. It ran northwards for several miles, passing just 0.1 miles from the confluence point. 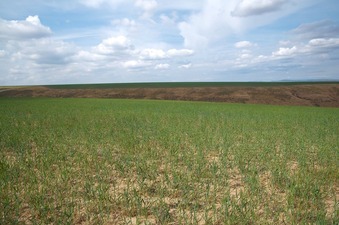 The confluence point lies on top of a steep bank, just inside a large wheat field.